Henry died the longest living member of the family at the grand old age of 102 years and six months. We no nothing of Henry's life except early naval career. We presume he outlived his wife Emily who was the same age. we have no details of them having any children. 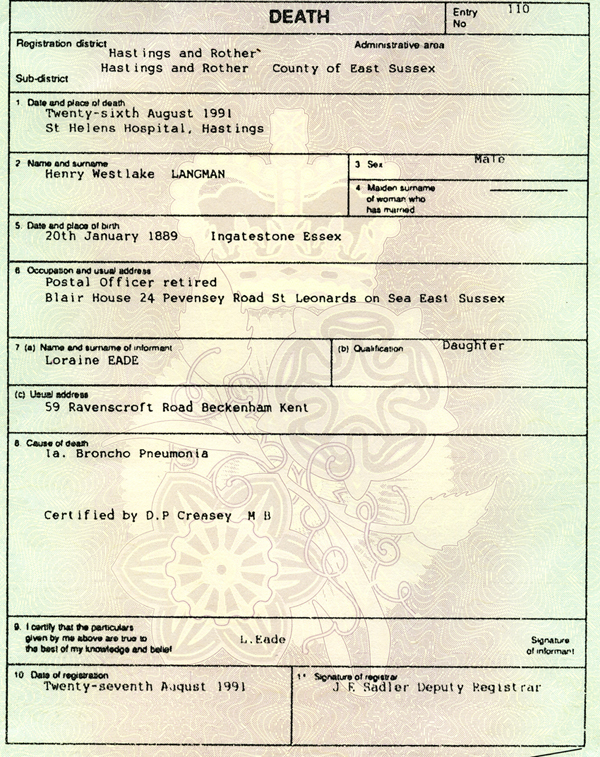 The death certificate shows that they had at least one child, a daughter named Loraine who is shown as the informant. Their daughter Loraine was now married her surname being Eade and living in Beckenham Kent. The Certificate also shows that Henry had been aretired Postal Officer and was living in a retirement home in St Leonards on Sea. He died at St Helen's Hospital Hastings.